I sense something. A presence I have not felt before. Myself. The Grand Annapurna Double. I had dreamt it for almost a year. It would be the first amongst many firsts that I would continue to attempt in the Nepalese Himalayas. Mid of 2011 is when I shared my dream with Tiger Channa. A phone call was all it took. ‘Varun, want to trek to Annapurna? We’ll reach a high of 17764 feet on the Annapurna Circuit Trail and then visit Annapurna Base Camp too’. Varun agreed and the rest like they say was history. The GAD would soon become our common aspiration and goal in the summer of April 2012. We tried to live the dream in every way possible in the months prior to departure. VC. Cheeky. Tiger. The man travels under numerous nicks. An ex-mumbai based ad-man turned int’nal marketing professional, Varun is currently based in Djakarta, Indonesia. It was a coincidence that we both started the journey and ended it together. We had certainly not planned it. Also wasn’t planned were the successes and camaraderie during the 21 Days we were away in the mountains. While it always helps to know someone from before, that’s only half begun. Friendships can be made or broken, built on or torn apart in the outdoors. That’s when personality and character are revealed, layer upon layer as each gets peeled away amidst situations we find ourselves in. Successes in the Himalayas can never be planned either. There’s nothing in your control, including the human ego. But more of this later. We first ran into each other at Delhi’s T3 at the Jet check-in counter. 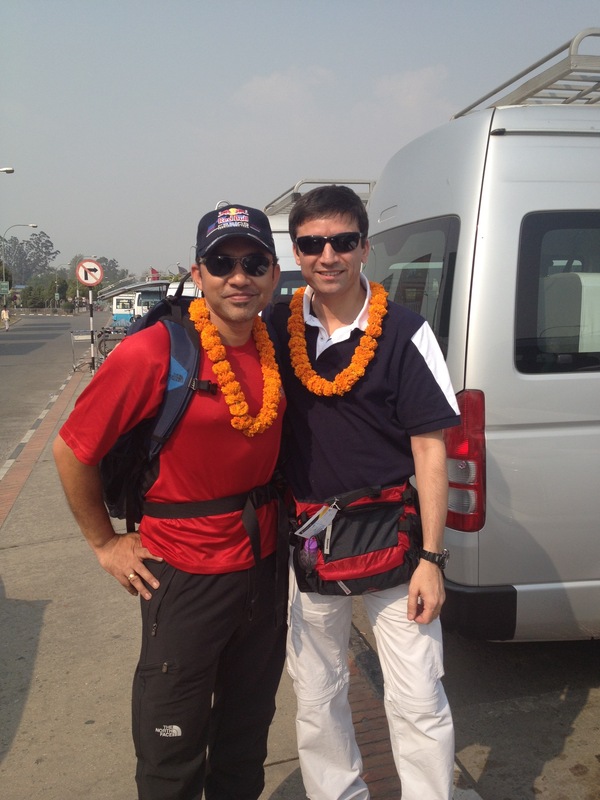 We were booked on the 12.55 pm and the 2.30 pm Jet Airways flights to Kathmandu. I wheeled the cart into the line that was and at one of the counters spotted a familiar fella. Varun Channa. With a shout we both greeted each other. While he got his boarding card, and proceeded towards security and immigration, I couldn’t as the flight was apparently overbooked and it didn’t seem possible that I’d get a boarding ticket. And to think that I was booked on it! I was then made to wait at a distance from the counters for what felt like an eternity, for an earlier flight at 12 noon. It was already 11.10am. What were they waiting for? I kept looking at the Jet staff for some encouraging signs. Besides glancing at me a few times, there were none that were forthcoming. I had to wait. With nothing to do, I kept myself busy taking in the sights and sounds of the passengers bound for Nepal. Passenger queues on all Kathmandu bound flights are easily differentiated. They have their own character unlike those for other destinations. Adventure seems stamped on everyone. Young and old alike stood patiently with their backpacks and day bags wondering what the delay and chaos was about; diverse nationalities all bound together by one agenda, one dream – to see the mountains or rather the Himalayas. Some seemed like they were on their first visit. Others on their 3rd or possibly 4th. They were also characterised by a gleam, a spark, and some sort of subdued excitement seemed to emanate from them; the ones who were quiet and by themselves had a far away look in their eyes and it wasn’t difficult to surmise what this was possibly directed at. Conversation also wasn’t difficult to initiate as I realised later and you ended up making more acquaintances than you thought you could or would. Meantime, Varun had cleared all formalities and was waiting for me to show up. When he called, I told him I would, but for the flight which was due to leave in 30! He had to ensure Jet didn’t leave without me. And that I yet had to make my way past immigrations which was likely to take forever if I didn’t show some urgency. Eventually I was asked to collect the boarding pass and with it in hand, I flew past the security check. I jumped the immigrations queue, excusing myself from the other passengers who were thankfully understanding. And then executed a desperate scramble for the departure gate with my day bag in tow. I just hoped my back pack found its way into the Kathmandu flight that I was soon to board. Bags tend to get misplaced, delayed or lost when least expected and needed the most. I was worried it wouldn’t reach the aircraft that mattered. The final boarding call had already been announced. Had the check-in staff informed their counterparts at the departure gate about me? Had the flight departed? I had to board, else my Annapurna itinerary would change. It would also impact the schedule of the second group. I had planned the itinerary such, that we would meet group 2 (those who had opted only to visit Annapurna Base Camp) on April 13th at Ghorepani. Varun and I formed Group 1 and we were attempting the double header. Tickets were booked. Arrangements finalised both from India and Nepal. It would be a logistical nightmare if things were to materialise otherwise. I was already thinking of what had to change if the need arose. Trekking boots are surely not made for a sprint I reckoned. I was struggling to land one foot after the other and ended up running flatfooted with a thump that was audible. Damn the stiff body of the Boreal’s! With these diverse thoughts streaking through my mind as I ‘sprinted’, I tried to zero in on my departure gate in the distance. Breathless, I finally reached it, only to be received by a wide grinning Channa. He told me to continue the dash down the escalator and get to the waiting bus. If I missed the bus, I’d have to chase the aircraft down the tarmac! By now he was grinning ear to ear. We screamed goodbyes and agreed we’d connect again at Kathmandu’s Tribhuvan International Airport. Descending two steps at a time on the escalator, I realised I wasn’t alone. Behind me were 4 other passengers all trying to get onto the same flight. Eventually the five of us did board. We were the last ones. No sooner had we entered and stuffed our luggage in the overhead bins, the aircraft started backing up. It was time. I made way to the window seat on the port side of the aircraft. Just perfect I thought. I’d get to see the peaks an hour into the flight. The last I’d seen them was in 2008. Sweating, I settled in, caught my breath and buckled up as the aircraft taxied towards the runway. A quick phone call to the wife that all was well and that I had made it, made me look forward in anticipation to my soon to commence Himalayan adventure. I peered out of the window as I experienced waves of nervous energy running through me and a hollowness in the insides. I was oblivious to the surrounding chatter of my fellow passengers and the safety instructions being announced by the airline crew. My adventurous tryst with the Annapurnas was finally afoot. I had waited 4 years to return to the Himalayas. Way too long I knew. In a matter of minutes I was airborne with the Delhi skyline fast disappearing from below me. The aircraft shot through space like a speeding rocket. The flight to Kathmandu was a little over 2 hours. I had ample time on hand. Herzog’s Annapurna kept me occupied most of the journey. I had increasingly become part of the 1950 Expedition. The boys were finalising plans for the summit attempt. How many would attempt the summit of Annapurna in 2012? Would I get to see the expedition teams as they made their way to ABC? I referred to the mountain’s illustrations in the book numerous times to paint a mental picture of it. Some of the topography could be similar I thought, irrespective of the mountain’s face I’d see. What caught my fancy was the mountain’s jagged Cauliflower Ridge. In between my mental musings, I looked out of the aircrafts’ porthole hoping to catch a glimpse of what I wanted to. There wasn’t much initially. Just white powdery clouds that we seamlessly cut through. Even the horizon seemed faded and lost in the sun’s haze. But hope always stays eternal. I waited. And waited. By now we were at a cruising altitude of 35000 feet. The temperature outside was a crushing -45 degrees centigrade. We were higher than Mt. Everest. I peered out yet again scanning all directions; down, to my left, right and far out into the horizon. All around us was an extended sheet of pristine white; a bed of clouds. Nothing else. It seemed endless. Then suddenly out of nowhere far in the horizon emerged something gigantic which looked like a summit of a Himalayan peak. It was the most surreal canvas ever. Here I was flying at 35000 feet, over a bed of white suspended all around and slicing that bed, clearly visible was a solid structure! First, one. Then, another. Then the ridge of what looked like a mountain range. I liked to believe what I saw was the Annapurna range. It looked like the illustration in the book. However I couldn’t be sure. If it truly was, it was majestic. A spectacle from the air. I reckoned it to be 10000 feet lower. How excited I was with what I saw. I pointed them out to my fellow passenger. A young woman from Austria who was also attempting the Annapurna Circuit with her friends whom she planned on meeting in Pokhara, Nepal. She saw them too, but ofcourse the significance was diluted. The spectacle lasted for a good 15 minutes and I couldn’t stop looking out. Icy Himalayan peaks are special. They stand tall. Ethereal. Majestic. Broad shouldered. High above everything else. Witnesses to the still environment around them. A lonely but proud existence. After 3 quarters of the next hour, the whites made way for a palate dominated by the greens and browns. Rolling mountain ranges continued. All covered with dense green. The tall pines had traces of soft snow on the branches. Terraced plantations flashed past as we commenced the descent. Human habitation, high altitude farming communities were a familiar sight from the mountains of India. Concrete structures soon made an appearance. New constructions, new apartment blocks in the midst of the old and existing, village like roads which seemed sandy and dust filled snaked their way in between, vehicles blowing smoke, locals walking, travelling in public transport busy with their daily work routines. Kathmandu, Nepal’s capital seemed to have been caught in a time warp. Nothing had dramatically changed 4 years hence, barring the new constructions which were fast dotting the city’s open spaces. Finally it was touch down. I was in Kathmandu. Modernisation had clearly evaded even the international airport. The conveyor belts didn’t work. They started, then stuttered to a halt, resumed only to stall yet again. I guess these were just minor hiccups for us travellers. We had loftier goals to achieve and mountains to visit. Stepping out of the terminal, I stopped at the NCell booth and purchased a pre-paid data connection which would hopefully last me the 21 Days I would be in Nepal. I had read in a mountaineers’ blog that NCell was the preferred mobile network while walking the outdoors. The agents at the booth also reassured me they were the best and I would get comprehensive coverage on the trail which I would soon walk. The data plan would not work at certain points however. That seemed fine with me. Now I was ready. The next thing was to scan the faces at the airport and hunt for Mr. Kumar Karki, the owner of Cultural Treks & Expeditions; the adventure outfit which would be responsible for us to succeed as we walked the Annapurna Circuit and the Annapurna Base Camp Trails. Kumar was a portly Nepalese gentleman, rather jovial and always smiling. Atleast that’s what I remembered of him since my last interaction 4 years earlier. A shout of ‘Debolin Saab’ caught my attention. There he was. He hadn’t changed either! I wasn’t surprised. Everything in Kathmandu was just the same. I waved out and before I proceeded towards him I spotted the familiar fella again. VC. He had exited the airport terminal and was trying to locate me. We walked towards Kumar. Introductions over, we made our way to the car park. Kumar welcomed us both with garlands. I assumed this was the Nepalese way to receive guests. Photographs done with, we got into a 1970s Toyoto Corolla and drove off to Hotel Manang in the very crowded, very narrow and bustling Thamel market area. The hotel where a certain Scott Fischer had first met Anatoli Boukreev in Oct 1995 and over multiple cups of coffee had recruited him as one of the primary climbing guides for all Mountain Madness clients for the following season. They were to climb Mt. Everest in that fateful summer of 1996. This entry was posted in Latest Journey and tagged 1996, Anatoli Boukreev, Annapurna, Che Guevara, Himalayas, Into Thin Air, Kathmandu, Mountains, Nepal, Scott Fischer, Travel, Trek. Bookmark the permalink.